WHY..?? as we guarantee departure based on a minimum of 2 people for certain dates. 10 June, 8 July, 12 August, 9 September, 7 October, 19 December, 2016. Gorilla trekking requires no formal ‘training’ but walking at altitude can be a little tiring. Paths may be muddy in patches, so we provide you with a comprehensive information / kit list for what to pack. With breath-taking mountain views, world-famous wildlife experiences and cultural immersions, Volcanoes National Park will surprise you with activities and experiences beyond a memorable gorilla trek. “The land of a Thousand Hills”, a green undulating landscape of hills, gardens and tea plantations. In the north, the magnificent Virunga Mountain range – a group of six towering volcanoes standing sentry along the border of Rwanda, the Democratic Republic of Congo and Uganda. They are located inside a national park, and are surrounded by over 150 km2 of mountain forests, and home to the Mountain Gorillas. The Volcanoes National Park was first gazetted in 1925 and includes Karisimbi, Bisoke and Mikeno Volcanoes. Apart from gorilla trekking, there are many other activities to be enjoyed in this area including forest walks, trekking golden monkeys, and a number of Cultural and Community Tourism initiates. On day 1 on arrival at Kigali Airport you will be met and transferred to Kigali Serena Hotel where you overnight on a bed and breakfast basis. The hotel is in central Kigali Rwanda, just 10km from Kigali International Airport. All rooms have air-conditioning, satellite TV and Wi-Fi. There are a number of restaurants to choose from, plus a health club on site and a large swimming pool. 24-hour room service is available, and there are tea/coffee making facilities in the rooms, hair-driers, a private safe and large twin or king-size bed. On your 2nd day you will be picked up for a Kigali city tour and Genocide Museum visit. The city was founded in 1907 by Dr. Richard Kandt under German colonial rule and became the capital only with Rwandan independence in 1962. It is built in a hilly country, sprawling across about four ridges with valleys in between. The city centre is located on one of these ridges, with the main government area on another. The tops of the ridges have an average elevation of 1,600 metres (5,250 ft), while the valleys are around 1,300 m (4,270 ft). The bigger houses and office buildings tend to be on the tops of the ridges, while the lower income people live in the valleys. The city is bordered most of the way by higher hills, with some suburban sprawl rising up these. The highest of these is Mt. Kigali, with an elevation of 1,850 m (6,075 ft) above sea level. Beginning on 6 April, 1994, Kigali was the scene of the devastating Rwandan Genocide – the slaughter of approximately one million Tutsi by Hutu militias (Interhamwe), and some members of the Rwandan army. There was fierce fighting between the army (mostly Hutu) and Tutsi-dominated Rwandese Patriotic Front. Although damaged, the city’s structure has recovered. Late morning, we continue to the place that Dian Fossey called home for many years – the foothills of the Volcanoes National Park. Fossey was an American zoologist, primatologist, and anthropologist who undertook an extensive study of Gorilla groups over a period of 18 years. She studied them daily in the mountain forests of Rwanda, initially encouraged to work there by anthropologist Louis Leakey. Her 1983 book, Gorillas in the Mist, combines her scientific study of the mountain gorilla at Karisoke Research Center with her own personal story. In 1988 it was adapted into a film. Sadly Dian was murdered in 1985 with the case still unresolved. While alive she was called one of the foremost primatologists in the world. Along with Jane Goodall and Birutė Galdikas, were the so-called Trimates, a group of three prominent researchers on primates (Fossey on Gorillas; Goodall on Chimpanzees; and Galdikas on Orangutans) sent by Leakey to study great apes in their natural environments. From Kigali we drive to the Musanze District (previously known as the Ruhengeri region) – approximately 2 ½ – 3 hours on good roads. Spend the night at Mountain Gorilla View Lodge inclusive of lunch, dinner and breakfast. Mountain Gorilla View Lodge is located in Kinigi in northern Rwanda on the edge of the Volcanoes National Park, home to the endangered Mountain Gorillas. The lodge is in the foothills of Mount Karisimba, one of the volcanic mountains that make up the Virunga Massif. The lodge is about 10 minutes’ drive to the main entrance of the Volcanoes National Park where gorilla trekking starts. Mountain Gorilla View Lodge is an eco-lodge with 30 spacious chalets. To ensure the least disruption of the surrounding environment, the lodge has been constructed with locally available material. Every chalet comes with a sitting area and a fireplace and has a tea/coffee making machine. The lodge supports the surrounding rural communities by purchasing farm-fresh produce that is served in the l restaurant. 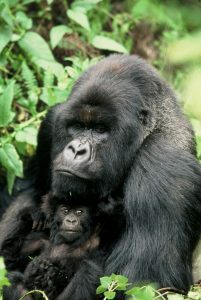 Day 3 – Today you get to trek the endangered Mountain Gorillas in Rwanda’s Volcanoes National Park. Situated in north-western Rwanda it shares its borders with Virunga National Park in the Democratic Republic of Congo and Mgahinga Gorilla National Park in Uganda. This region has five of the eight volcanoes of the Virunga Mountains (Karisimbi, Bisoke, Muhabura, Gahinga and Sabyinyo), which are covered in rainforest and bamboo. After a briefing with National Parks’ personnel, you will be taken to the start of your Gorilla trekking hike. Your walk to the gorilla family may take anything from 30 mins to several hours – following your guide into the beautiful forests. Along the way you may encounter golden monkeys, as well as a range of birdlife and other forest dwellers. Once you reach the Gorilla family, you will be privileged to spend an hour watching them as they interact with each other, possibly eating, grooming or playing.. it’s a humbling experience to sit amongst our ‘cousins’ – with them being at such close quarters and yet, so at ease with humans. On your last day you will be transferred to Kigali Airport for your return flight. This safari is available on a scheduled departure basis, GUARENTEED with min of two persons, on the dates above. These dates tie in with the range of Tanzania or Uganda safaris if you would like to combine. Excluded: Airfare, taxes, visa cost, park fees, gorilla trekking permit (USD750), travel insurance, health requirements, tips, drinks, additional meals, and any additional cost not specified. All prices are subject to change due to rate of exchange fluctuation or any unforeseen price increase. Terms & Conditions apply. E. & O.E.